Daily meditation and spiritual practices are essential to personal growth. Regular daily meditation is transformational. The invisible foundation of Ananda Sangha is the individual sadhana of all its members, united in one loving call to God. Start your day in a supportive, centering, peaceful environment as you practice your meditation. 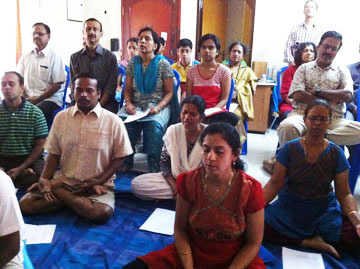 Through group meditation, group energy is extremely beneficial to individual sadhana. * We start with energization exercises beginning 15 minutes before meditation starts followed by a reading, a prayer and chant. We end with healing prayers and a reading from Swami Kriyanadaji’s book, Living Wisely, Living Well. * Feel free to enter or exit meditations as needed.